Original Proprietors of the National Mall's Land, “Original Proprietors of the National Mall's Land,” Histories of the National Mall, accessed April 22, 2019, http://mallhistory.org/items/show/94. 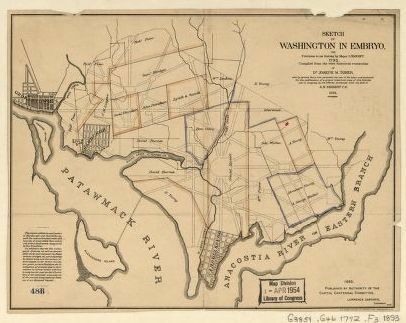 In 1791, 15 landowners negotiated with President George Washington to give the government land for the creation of a new federal capital, Washington. Land from Daniel Carroll of Duddington, David Burnes, and Notley Young became the National Mall. Property boundaries were vague, making it possible that Samuel Davidson, Benjamin Oden, James Williams, or Uriah Forrest also contributed small portions of their lands to that which became the National Mall. Library of Congress Geography and Map Division. View original image. Daniel Carroll of Duddington was the son of Charles Carroll. His estate was the largest of all those which made up the new federal territory. Most of the Mall and all of the land on which the Capitol sits belonged to him. Notley Young was Daniel Carroll's uncle and owned land to the south of Carroll's. At the time of the 1790 census, he was the third largest slaveowner in the state of Maryland, although most of his slaves probably worked at plantations elsewhere in Maryland. Young's land included the very southern part of the Washington Monument Grounds, and the coast of the Potomac River which faced what is now East Potomac Park, but at the time was just marshland. David Burnes owned land originally bought by his grandfather, also named David. Although initially unwilling to sell his land to the government, he changed his mind and signed on in 1791. His land was north of Daniel Carroll's, mostly north of what is now Constitution Avenue. The White House, South Lawn, and Ellipse are all on land that belonged to Burnes. Benjamin Oden owned land that stretched north from Tiber Creek, now Constitution Avenue. His land definitely included the area that is now Union Station, but it may have stretched down to Pennsylvania Avenue close to the Capitol. Samuel Davidson owned a tract of land in an area called Port Royal. The southernmost part of his property is now Lafayette Square. A small parcel of land, roughly where the Museums of American History and Natural History are today, belonged to the Beall family before the Revolutionary War. Because they were loyalists, the state of Maryland confiscated the land. In 1793, after the agreement with the President but before development had really started, James Williams and Uriah Forrest bought that land from the state. Forrest had already agreed to sell what he bought to the federal government.